The redevelopment on a former RAF base on the Isle of Man could be a "catalyst for regeneration," an MHK has said. The Department of Infrastructure (DoI) said there had been "great interest" in the RAF Jurby site, following a request for development suggestions in July. Julie Edge MHK said there had been a "broad range" of submissions, including plans for housing and workshops. A DoI spokesman said the plans for the 25-acre site would be assessed ahead a report to political members. 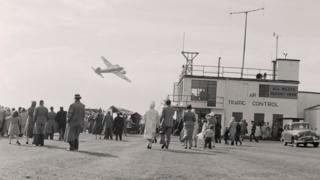 RAF Jurby opened in 1939 and helped protect Belfast and Liverpool from air raids during World War Two. It was also used for training and was home to a variety of operational squadrons. After closing in 1963, it was used as a diversion airfield for Ronaldsway Airport until 1972. Ms Edge said she hoped the redevelopment of the site would "provide jobs" and be a "catalyst for the further regeneration of the north of the island". The DoI spokesman said there had been a high level of engagement among local residents in the submissions process and other ideas for the site included housing start-up businesses and leisure and recreational facilities.